Aliens. We always knew they were out there, ready to invade our planet, enslave the population and strip mine its resources. But we also knew that if they should try it, Earth’s greatest superheroes would rise up and save us. When the V’Sori came they slaughtered our super-powered defenders just as easily as they did our armies. Now our cities are conquered, our people are terrorized, and the job of saving the world has fallen to the most unlikely of people: Earth’s super villains. Necessary Evil: Explorer’s Edition is a campaign sourcebook for Savage Worlds published by Pinnacle Entertainment. In addition to introducing super powers to the game (since codified in the Super Powers Companion) its “plot points” campaign allows players to take on the role of supervillains ensuring that if they can’t have the Earth, the aliens can’t either. While the super powers material is potentially redundant thanks to the aforementioned Companion, Necessary Evil remains a good pick for time-stressed game masters looking to challenge their players with an epic quest. Necessary Evil: Explorer’s Edition (2008) is a 188-page digest-sized, soft-cover update of the campaign source book originally released in 2004 and re-printed to match the format of the popular Savage Worlds: Explorer’s Edition rulebook. Character creation is identical to the core Savage Worlds rules, with characters getting Traits (Strength, Agility, Spirit, etc. ), Skills, Hindrances and Edges. While there are a few supers-specific hindrances – gloater, heartless, power negation, terminally ill – the bulk of the additional rules come in the form of new superpowers purchased using the “Arcane Background: Superpowers” edge. Like HERO System or Mutants and Masterminds, Necessary Evil is based on a point buy system. Players start with 10 power points, which are then used to buy powers like “Storm” (3 points), which commands the elements, “Shrink” (3 points), which can be used to reduce one’s size to 1″, the old villainous standby, “Illusion” (2), which lets villains mind-trick their opponents with mental constructs. Most powers can be further enhanced by buying power ups. For example, characters with “Storm” can create localized gale force winds for another power point, or summon lightning strikes for another three. It’s a straightforward system that lacks the complicated powers calculus of HERO or Mutants & Masterminds. Whether that is a strength or a weakness is a matter of personal taste. These rules allow players to easily create superheroes that fall in the Teen Titan and Uncanny X-Men range. They’re not the biggest and beast supers on the planet – those have likely already been hunted down and killed by the aliens – but they can still pack a punch. Creating more powerful heroes – say at the Justice League or Avengers level — isn’t covered in these rules, but the Super Powers Companion handled the problem by simply increasing the amount of power points players got when they took the “Superpowers” edge. Earth’s villainous liberators are given a host of new equipment options. Personal armor options include “ablative armor”, which soaks wounds on behalf of the player character, but degrades with every hit and “DuraWeave Armor”, which is light-weight armor that can be warn beneath clothing (and presumably spandex as well). High-powered weapon options include Atlantean electro-lances, which deal shock damage to opponents, vibro-weapons that can cut through armor, nullifier guns, which temporarily suppress super powers, and the foam thrower, which can fill an area with quick-hardening foam. The game also provides stats for alien gunship, starfighters, armored transports, and cargo transports and assault tanks. This equipment plays a major role in the campaign, and its good to see everything properly statted out to support it. 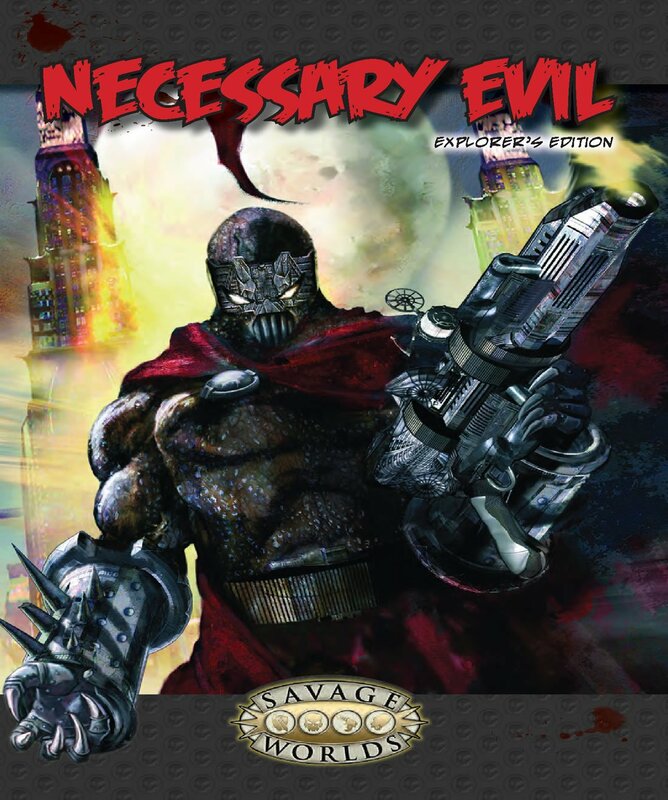 Necessary Evil includes a “Plot Point” campaign, an 11 step outline that introduces the villains to the superpowered resistance movement called Omega, and then walks them through the process of overthrowing the Earth’s alien invaders. Omega is led by Dr. Destruction, a supervillain who tried to conquer the world on multiple occasions, and isn’t about to let a bunch of aliens succeed where he failed. The plot point campaign is supplemented by a number of “Savage Tales” – short one-shot adventures that can easily be inserted into the main campaign to slow down the main story, give the players more experience, or just mix things up. This is all well and good … but that’s the problem. It’s a little too good. The campaign kicks off with the premise that the player characters are villains, little in the Plot Point campaign forces them to choose between good and evil. The assumption seems to be that the villains will overcome their worse natures, and rise to become heroes. As a result, the villains end up being more Dr. Evil than Magneto, more Syndrome than Darkseid. I’d love to have seen more moral challenges for the PCs to wrestle with: Save the baby from the burning building, or recover the plans to the alien death ray? Prevent the plane from crashing, or preserve your low profile? Fight the aliens … or join them? These kinds of choices would have added depth to the campaign and helped define who the heroes/villains really are. Granted, these are components that game masters can easily add into scenarios on their own, but given the premise, I was disappointed to find so little of it baked in. Most of the action in Necessary Evil takes place in Star City, an artificial island raised by a powerful alien known as the Outsider, and subsequently claimed (and colonized) by America. As befits its name, the city looks like a giant four-pointed star, with each arm containing its own district. Unlike many of the world’s other major cities, which were devastated by the alien invasion, Star City was largely unscathed. The downside for the inhabitants is that it is now the seat of alien power. The book does a decent job of highlighting notable locations in the city, with three to four entries per quarter. Combined with the Plot Point campaign itself, its enough to provide players with a decent idea of what the nature of their home town. It’s a far cry from Green Ronin’s Freedom City Source Book, but it’s decent given the size of the Necessary Evil book. The major flaw in its presentation is the map: while a photo-realistic map of Star City is included in the book, none of the locations are keyed. While game masters could ad hoc locations in the city, that conflicts with the easy-of-use implied by a Plot Point campaign; if I’m running this out of the box, I want the locations on the map. The original edition of Necessary Evil caught flak from gamers who didn’t like the Secret Wars-esque deus ex machina conclusion. The Explorer’s Edition attempts fixes this by adding an 11th plot point that presents a more satisfying smackdown with the alien overlords. Personally I’d choose to run one or the other; having both make it seem like a Hollywood movie with one too many endings. Necessary Evil is a great idea unevenly executed. The lack of compelling moral choices in the book may be disappointing to some, but others may find its default heroics to be a good choice for their would-be Dr. Horribles. The Plot Point campaign is potentially a huge time saver, and while I may quibble over the execution, it provides a decent framework for building a campaign. Those who prefer to create their own superhero worlds should get the Super Powers Companion instead, which has the same power rules but also adds rules for secret lairs and an impressive rogue’s gallery of heroes and villains. Necessary Evil may still be useful for such GMs as a source of ready-to-run one shot adventures, but as a source of inspiration, Green Ronin’s Freedom City offers a better ideas-per-dollar value. This review originally appeared on GameCryer.com and is reprinted with permission. #RPGaDay2018 – Which game do you think deserves greater recognition? #RPGaDay2018 – Which game mechanic inspires your play the most?